Scooper - Technology News: Who are the world's great internet powers? Who are the world's great internet powers? 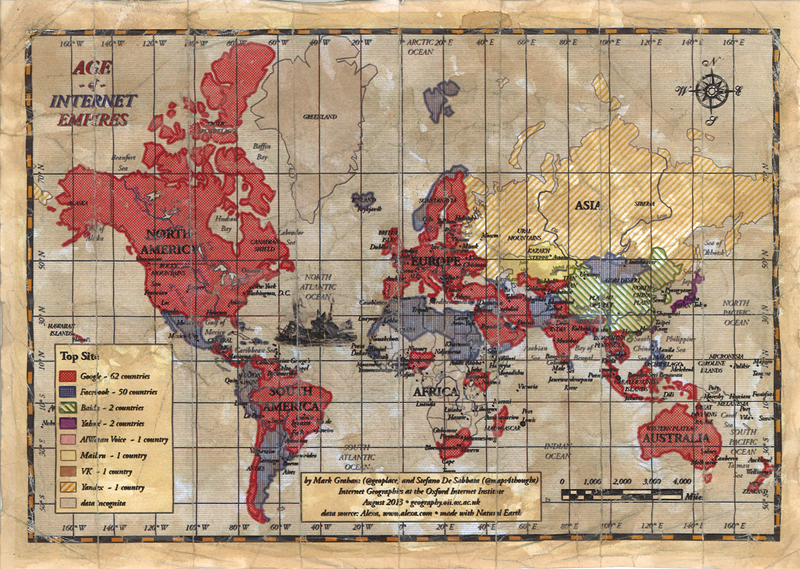 If the internet played out like an episode of Game of Thrones , with noble houses vying for territorial control, what would the world look like? Not surprisingly, Google and Facebook would be in a battle for global supremacy. But the two superpowers would have strong footholds in different regions. Google rules in North America, Europe and Oceania, while Facebook holds the Middle East, North Africa and Spanish-speaking Americas. Russia, as always, has fended off invasion, this time by having its own Russian-language social network, VK . In Asia, some countries are also holding out. Baidu is the most used search engine in China, while Yahoo! is still widely used in Japan. South Korea also has its own search engine, Naver . The above map was created by the Oxford Internet Institute in 2013 using data from web analytics site Alexa . The original title, the Age of Internet Empires, is a play on the popular online game Age of Empires .